If you're already treating yourself to a pizza delivery for dinner, then chances are there's not a whole lot left of your self control to prevent you from adding a decadent dessert to your order. Of course, it's safe to say that pizza chains know this and offer all sorts of sweets -- from lava cakes to giant cookies -- to tempt you. The latest of these impulse traps comes from Pizza Hut and, well, it's a doozy: Cinnabon cinnamon rolls. Yes, that's right: You can now get Cinnabon with your Pizza Hut pizzas. 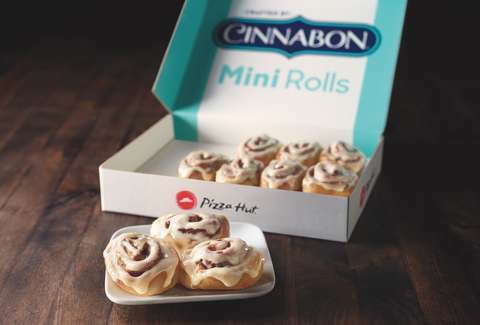 Starting on Monday, October 8, the ubiquitous pizza chain will begin offering miniature Cinnabon cinnamon rolls for delivery, carryout, and dine-in orders nationwide, according to a company spokesperson. Each order comes with 10 mini cinnamon rolls made with Cinnabon's signature makara cinnamon and cream cheese frosting. It's as if resisting the urge to throw in some breadsticks wasn't already hard enough. They'll set you back $5.99. The news comes just a few months after Pizza Hut announced an expansion of its beer delivery offering. In other words, there's a chance you can feasibly get pizza, dessert, and beer without having to leave the house and with very little human interaction. You can now take lazy to whole new levels. It was nice knowing you. Tony Merevick is Senior News Editor at Thrillist and cannot imagine scarfing down some cinnamon rolls after eating a pepperoni pizza, but live your best life, folks. Send news tips to news@thrillist.com and follow him on Twitter @tonymerevick.